BACKGROUND: Gastrointestinal stenting is most often utilized for end-stage palliation for unresectable malignancy. We propose the concept of gastrointestinal (non-biliary) stenting as a bridge to surgery for benign conditions, as well as, neoadjuvant stenting for malignant diseases. METHOD: All stents were placed in the operating room under general anesthesia, with endoscopic and fluoroscopic techniques. All foregut stents were placed for nutritional repletion in place of parenteral or percutaneous enteral feeding. Colonic stents were placed for strictures or colonic cancer to relieve obstruction. RESULTS: Over 60 enteral stents were placed during a 7 year period, mostly for esophageal cancer palliation. In 13 patients, enteral stents were placed with the intention of performing a subsequent operation; 9 patients had esophageal stenting (5 removable polyester, 4 covered metallic, 4 stents for benign disease), 1 duodenal metallic, and 3 colonic metallic stents. There were no perforations, no aspiration events. All colonic stents underwent resection without colostomy. The patient with duodenal stent was not resectable secondary to metastasis. Three polyester esophageal stents had migration, and were replaced. All esophageal stenting patients underwent successful surgery. CONCLUSIONS: Gastrointestinal stenting is an acceptable strategy as a bridge to planned surgery. Colonic stenting for obstruction may obviate the need for colostomies. Gastroesophageal stenting enhances nutrition during neoadjuvant treatment periods, reducing the need for enteral feeding tubes or parenteral nutrition. 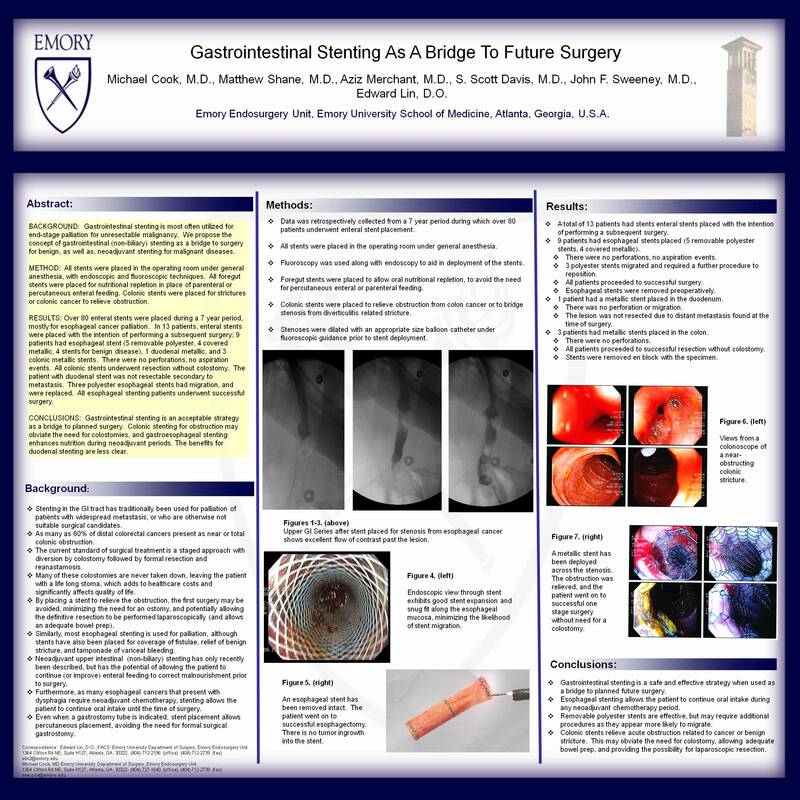 The benefits for duodenal stenting in preparation for future surgery are less clear. This is also the first report of temporary gastroesophageal stents placed for benign conditions prior to definitive surgical treatment.